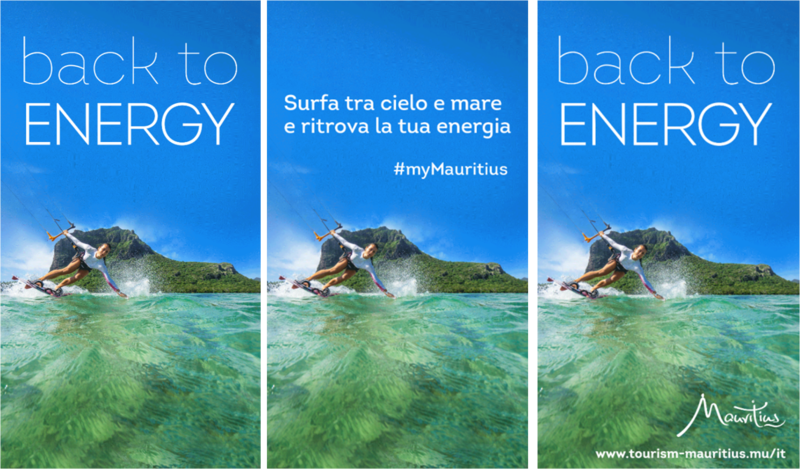 AIGO signs the new advertising campaign to promote the destination of Mauritius. The out of home activity is going to be performed in the cities of Rome and Milan from the 5th of November 2018 and will last for one month. The campaign concept focuses on the claim “Back to …” inviting travelers of the digital era to go back and experience simple and pure emotions: Mauritius is the place to find pleasure and rediscover one’s inner self. To better communicate the wide range of proposals offered by Mauritius and to convey the key elements of its offer – which is suitable for many target travelers and diverse audience’s needs – the campaign has been divided into three subjects: Back to Relax , Back to Energy, Back to Happiness, focusing respectively on the breathtaking beaches of the Indian Ocean, on the sporting activities offered by the island – from kitesurfing to kayaking and much more – and to promote Mauritius as an ideal destination for children and families. The campaign will be displayed on 40 digital screens across the city of Milan where more than 30,000 screen transitions will be reaching an audience of about 28 million people. Moreover, in Rome, the digital screens campaign will travel together with the Euro Tram, which will be visible to over 1.1 million people for the whole campaign duration.